Students’ final year of undergraduate study is filled with opportunities to make fond memories while preparing for life after their time at the College. 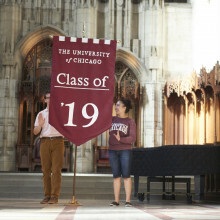 From Senior Week and unique traditions to Convocation, the College plans numerous events to help commemorate the UChicago experience. Below find information about how to make the most of your senior year and plan for the road ahead without missing important deadlines and opportunities. In an effort to provide you with an abbreviated list of information to consider during the quarter, we have consolidated a list of important dates and deadlines. We hope you will utilize this information as a guide. Students who borrowed federal student loans are required to complete an exit counseling session before graduation or during your last quarter of at least half time enrollment. Senior Week ticket sales begin. College students whose academic records show marks of I (Incomplete), Q, or no grade at all in courses attempted prior to the quarter in which they expect to graduate and which are required for the bachelor's degree, must complete the course work and have a passing grade on record with the University Registrar by 3 P.M., Friday, of the 9th week of the quarter (eighth week in Summer). This deadline also applies to final grades for Bachelor's papers, essays, and projects regardless of quarter in which the student was enrolled in respective courses. College students who are registered in the quarter they expect to graduate for courses required by their degree programs must have final grades for these courses submitted to the University Registrar by 11:59 PM, Saturday of the tenth week of the quarter (ninth week in Summer). Senior Week runs from Sunday, June 9 through Thursday, June 13, 2019. 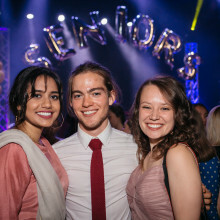 The kick-off of Convocation Weekend begins on Friday, June 14, 2019 at 2:00 PM with Class Day, a celebration of the class' accomplishments and achievements, followed by a dessert reception for the Class of 2019, their families, and guests at the Museum of Science and Industry at 7:30 PM. Parking at the museum is free for this event, and tickets are not required. Make sure to submit your donation to Senior Class Gift by Friday, June 14, 2019. Throughout spring quarter, the College will provide important information to students leading up to Convocation in June. Copies of each message will be linked in the space below. As you prepare for life beyond the College, we've created a new series of videos to help you tackle the transition into adulthood and master best practices. As you approach the end of the academic year we encourage you to think about your future. We hope you will embrace your new role as alumni and find opportunities to continue your relationship with the College, as there are numerous ways for you to stay involved. 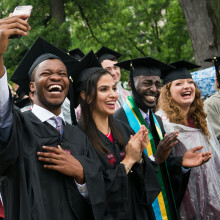 Please take the opportunity to learn how you can stay connected to the University of Chicago through the Alumni Association and how the College can continue to be a resource to you post-graduation.